When I taught in the classroom, we typically had three days before we jumped into the content. During those three days, we covered handbook, policies, had a whole-school assembly to discuss school expectations through Positive Behavior Intervention Support (PBIS), labeled our folders, notebooks, wrote our names in textbooks, and we learned all of the daily procedures for the classroom. The only thing I did during those first few days that was student-led was allowing them to create their own rules for the classroom. Even then, the rules usually landed in one of four areas, so class rules ended up being the same every year. Be respectful, be responsible, be punctual, and be prepared. After 5 years, I can still rattle them off. It wasn’t until several years had gone by like this in the classroom that we did any culture building at the beginning of the year. This is when we were introduced to Kagan Cooperative Learning and I instantly loved the Class Builders. From then on, I would do activities where students were stranded on a desert island and had to order their supplies from most important to least important, or students would have to decide which of five patients on a donor list would get the next available heart based on the information given. They would have to advocate for their patient to their peers. In the elementary media center, I would go over care of books, expectations, and allow students to check out books for the first time and we would discuss how I wanted that done. In the middle school media center, I still do the expectations discussion and allow them to check out books, but we don’t really discuss care of books at length. Last year, I revamped the lesson to include rules & expectations shown through memes. I was super pumped about the lesson, but according to my students’ survey results at the end of the year, 25% of the students didn’t even remember the lesson while another 41% said it was just alright. I listened to the students. I knew I needed to do something new with the opening lesson in the media center so I was super excited to see that book 40 was The EduProtocol Field Guide by Marlena Hebern and Jon Corippo! This book had exactly what I was looking for!!! I had read it back in April after purchasing it from Dave Burgess at an event in a nearby county. (I blogged about how inspired I was after that event here.) So I knew that this book held the answer, but I couldn’t remember specific directions to the protocols. I just remembered being excited to implement the protocols this year, as my media time with students was already coming to a close when I discovered the book last year. One of my very favorite things about this book, (other than the actual protocols, which are on fire) is the banter between Marlena and Jon in the margins! Their personalities totally shine through the pages! I also love that there is plenty of space to write notes in the margins of the page! This is truly a manual to keep fingertips away when creating experiences for students! In the 100th episode of Kids Deserve It with Adam Welcome and Todd Nesloney, Adam asks Dave who is “inspiring him right now”. His answer? See the video below. It is that very idea of immediately implementing that has me still awake after 2:30 in the morning completing book 40 and writing this post. I’m so excited about the overhaul in my media lesson for this week that I had to blog it instantly. I can’t wait to get feedback from the students to learn their reaction to the changes! Reviewing media expectations won’t be done with a lecture this year, not even a slide deck with memes! Instead I am creating a review game in Quizizz where students will guess my response to various scenarios. (This game will be linked in the implementation blogs to follow in the coming weeks.) Students will play the game independently, then we will review missed questions and they will immediately play the game again with the same questions (although likely in a different order). This Smart Start is called “Fast and Curious”. A Smart Start provides a warm-up of sorts for the EduProtocols to follow. It shows students the up-tempo pace (I love this concept of shortening the amount of time given to complete assignments/activities/protocols in order to create a sense of urgency rather than procrastination!) It’s also just fun, and something outside the expected “first day” routines! Jon & Marlena have their acronym game on point in this book! Several examples of well-used acronyms are available in The EduProtocol Field Guide, with one of them being the Smart START guiding principles. The guiding principles of Smart START are Smile (keep it fun), Teach (finish on time), Activities (developing the culture and practicing tech skills that will be needed), Routines (structured, but fluid), and Target Barriers (students are already learning one another’s names and finding similarities between themselves and their classmates)! Flipgrid & Five Words Form: Students will share their reading goal (only visible to the student, me, and their ELA teacher) and give themselves a little pep talk (think Kid President style). This video will be revisited in October when I see them to motivate them to continue pushing toward their goal. In November, they will create a video response sharing whether they met their first quarter goal or not. They will then identify a new goal for 2nd quarter and record it. This will happen throughout the year. Also in this station, students will complete a Google Form survey about what five words describes their core classes (math, ELA, social studies, science) and their encore classes (art, band/chorus, pe, computer science discoveries, project lead the way 1 and 2). These results will be compared to the responses from teachers about what they hoped students would say about their experience in their classes. Book Checkout: Students will be encouraged to check three books out of the media center and reminded that they will return to the media center in two weeks to exchange books. Soap box moment: Students can select ANY book they’d like from our shelves. I don’t care if it’s graphic novels, Diary of A Wimpy Kid, Dork Diaries, or Shakespeare. I just want them to get something they are interested in and READ! Club Information & Sign-Ups: I sponsor multiple clubs at my school, both in the afternoons and in the mornings. I always look forward to having students engage in these clubs and getting to know them in a much more informal manner. I will unveil the 8th grade puzzle and allow 8th graders to sign up to work on it, as well as share information in our Google Classroom about Makerspace Managers, Innovation Engineers, Between the Lines Book Club, Battle of the Books, and Virtual Reality. Students will signify interest in any of the clubs they’d like by signing up on one of the whiteboard around the media center (also giving them time to move and check out any new furniture, books, etc they haven’t yet seen in their space). Those students will have permission forms sent home the following day. After stations, we would have moved into the “Things That Rock” Smart Start, but the power of Twitter is tremendous! Check this out! I posted the lesson outline on Twitter. You’ll have plenty of time- so no need to do them all at once! Oh no! Well, I think then in that case you chose well. I’d probably leave out Things That Rock unless you have a really long period and need a movement break. Just go into Worst Preso. And have fun! Yes… yes I did just collaborate with the author of the book while planning my lessons for the week (my implementation plan). <insert squeal here> I’ve just got to reiterate how incredible the authors of Dave Burgess Consulting, Inc are! They are tremendous educators, amazing authors, and most importantly, exceptional humans. So following Marlena’s advice, I am going to move Things That Rock to the end as an additional activity if needed. I will move the What People Think meme creation up as a school-wide collaborative document. Each student will be given a slide and they will reflect on the changes in the library and what they feel they can expect from their time in our media center. Upon completion, we will complete the Smart Start of “Worst Preso Ever” in which we watch a short video about poorly designed presentations and they intentionally create a slide in a poorly designed presentation of their opinion of their first impressions of the school year. I am so excited to implement this plan (created with input from Marlena – WOO HOO) for The EduProtocol Field Guide! Truly, I am hoping to eventually use all of the Smart Starts and EduProtocols this year, but for the purpose of #DBC50Summer, my implementation will be these first lessons with every student in the school this week! 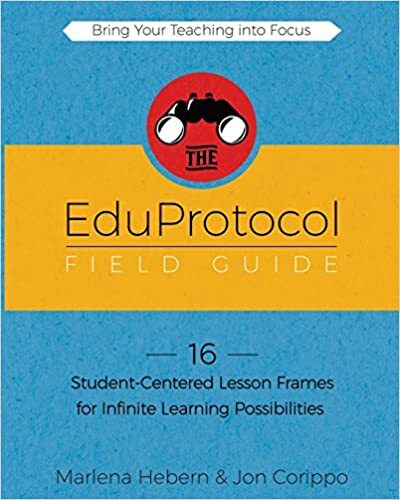 Follow the incredible conversations surrounding this book on Twitter using the hashtag #EDUProtocols! Marlena and Jon are both very active on Twitter and I highly suggest following them at @mhebern and @jcorippo, respectively. There are many podcasts featuring the authors and/or the book, so I would suggest just using “the power of the Google” to listen to them (or watch them on YouTube). You will definitely want to check out the EduProtocols website! As always, check out the flipgrid and share your favorite of the #EDUProtocols or Smart Starts! Big thank you to Andrea Paulakovich for allowing me to co-pilot this awesome global collaborative space for all DBC, Inc books!